The director of the latest Star Wars movie has said it's time an episode in the series was entrusted to a female and/or non-white film-maker. "Hell yes it's time," said Rian Johnson at a press conference for Star Wars: The Last Jedi in central London. "There are so many incredibly talented female directors, directors of colour out there, and so many that I would love to see play in this universe." Every Star Wars director from George Lucas on has been a white man. The Last Jedi and its predecessor, 2015's The Force Awakens, have been praised for having a female lead character and an ethnically diverse cast. Yet the director's chair has remained an all-male preserve, despite the woman in charge of the series - Lucasfilm president Kathleen Kennedy - expressing a desire for it to have a female occupant "when the time is right". New additions to the Star Wars ensemble in The Last Jedi include Puerto Rican actor Benicio Del Toro and Kelly Marie Tran, the first Asian-American actress to have a lead role in the series. Tran, 28, said she "felt at home" on the set despite being "this complete new person", adding that she would be "reliving those moments we had on set for the rest of my life in my mind". Rian Johnson, whose previous films include Brick and Looper, said it "felt good" for the franchise "to reflect the world a little more closely as it is today and how it looks around us". Yet he promised this would not extend to taking the series to Earth. He's been invited to create a new Star Wars trilogy once the current trilogy concludes in 2019. "In so far as it is within my power, I solemnly promise that Luke Skywalker will never fade up into modern-day New York, even though it would be a really funny fish-out-of-water story," he joked. In The Last Jedi, Daisy Ridley's character Rey is seen seeking tutelage from Luke, who is discovered living a reclusive existence on a remote planet called Ahch-To. Her story unfolds in tandem with those of Finn (John Boyega) and Poe (Oscar Isaac), who are tasked with stopping the Resistance from being wiped out by the evil First Order. Mark Hamill, who plays an ageing Luke, expressed admiration for the film's younger cast members while admitting some disquiet over their roles in the film. "I had to fight the irrational urge that it's a bunch of strangers rummaging through my old toy box playing with my toys," said the actor, who turned 66 in September. "But basically at this age I'm happy to let the kids do the heavy lifting." The Star Wars franchise is one of the crown jewels of the Disney empire, which bought George Lucas's production company in 2012 for $4.05bn (£3bn). 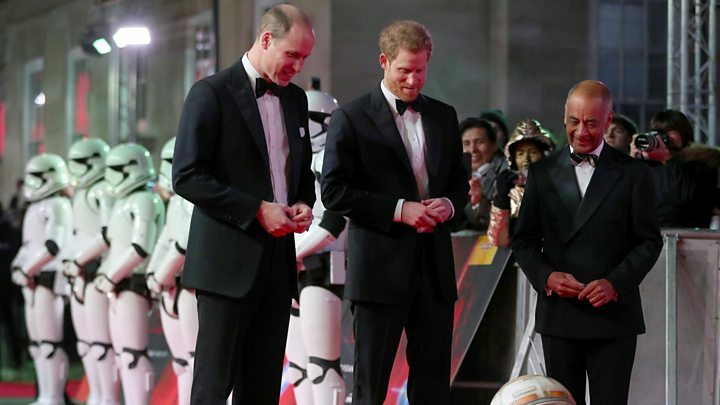 It's fitting, then, that The Last Jedi should come with a royal seal of approval from Princes William and Harry, who visited its set last year. It subsequently emerged that the royals had shot a scene in which they were disguised as stormtroopers, the helmet-wearing soldiers of the film's villain. Johnson, though, told reporters he could "neither confirm nor deny" such a scene was filmed, or whether William and Harry had made it into the final edit. This was despite Boyega claiming on TV earlier in the day that the scene had been axed and that he had personally apologised to the princes at Tuesday night's premiere. Speaking at Wednesday's press conference, Ridley admitted she hadn't found showing the royals around the Pinewood set an entirely comfortable experience. "I'm not great at small talk, so I found it a bit awkward at the beginning to be honest," said the 25-year-old, who recently had a role in Sir Kenneth Branagh's Murder on the Orient Express. Hamill, meanwhile, said he had sought guidance from the royal siblings on whether Luke, whom he first played in the original Star Wars film in 1977, was also a royal. "Unfortunately it was a split decision, because William said yes and Harry said, 'I need more information.'" Leia, of course, is played by the late Carrie Fisher, who died last December shortly after completing her work on the new film. "Carrie was first and foremost a writer and that's how we first really connected," said Johnson. "I feel really lucky to have had even just a little bit of time to get to know her." Cast member Domhnall Gleeson, meanwhile, said Fisher had been "really generous" with her time and "amazingly big-hearted". "Nobody knew what was going to happen with Carrie, obviously, and I love that Rian wrote her a beautiful film," the Irish actor said. Star Wars: The Last Jedi can be seen in UK cinemas from 00:01 on Thursday.